Modern, clean lines. 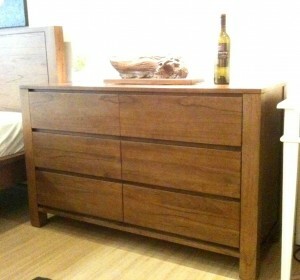 The Element chest of drawers is made of solid Mindi wood famous and well-known for its distinct yet subtle wood grains. Crafted from the finest hard woods from Indonesia, 2010 Lifestyle uses the highest quality materials for its collections. Each piece is able to be custom fit to suit your space requirements and unique preference. Ranging from traditional, heavy solid wood furniture and modern rustic products like Suar wood tables and benches, all the way to relaxing outdoor furniture classics like our best-selling Bologna and Alaska designs, you are bound to find something to love, here at 2010 Lifestyle!